afrol News, 13 May - Nigeria's new President Goodluck Jonathan is choosing governor Mohammed Namadi Sambo of the northern state Kaduna as his deputy. The northerner will help Mr Jonathan in regaining the precarious north-south equilibrium in Nigerian politics. 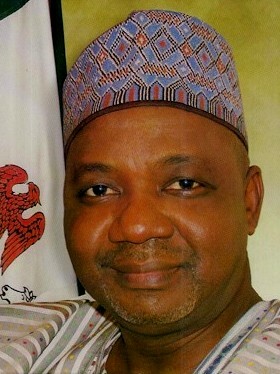 Official sources in Nigeria have confirmed the naming of governor Sambo as the country's new Vice President. Mr Sambo, 57, is a trained architect and has been governor of Kaduna since 2007. More important, he is a Muslim and from the country's populous northern half. The naming of Mr Sambo is so far only a presidential decision by Goodluck Jonathan. The still-governor has to be approved by the Abuja federal parliament before officially being named to the influential position. The need to name a new Vice President comes after the death of Nigeria's elected President Umaru Yar'Adua last week. Vice President Jonathan, who had acted as Nigeria's head of state during Mr Yar'Adua's hospitalisation, was sworn in as the nation's new President. But the power change in middle of the presidential term threatened to upset northern Nigerians and to challenge the traditional power balance between the Muslim north and the mostly Christian south. This unwritten power sharing deal foresees an altering of northerners and southerners in the Abuja presidency. President Yar'Adua, a northerner, would be in power for one or two terms, with main challengers for his second term being northerners. As a power check, a southerner was to function as Vice President. After the 2011 elections, the gentlemen's agreement therefore foresaw continued power to a northerner with a southerner as his deputy. Only in the 2015 elections, a southerner was in line to take over Nigeria's presidency. With last week's swearing-in of Mr Jonathan as President, angry voices in the north already warned that this upsetting of the power balance could only lead to instability and turmoil in the populous country. The naming of a Muslim northerner as Vice President thus is a signal by President Jonathan that he wishes to restore Nigeria's fragile power balance. It nevertheless does change the fact that the foreseen timetable for north-south power transfers has been upset by the death of President Yar'Adua. Speculations in Nigeria and beyond are now loud about how President Jonathan and his ruling People's Democratic Party (PDP) will go about the 2011 elections. The question is whether the PDP can be persuaded by President Jonathan to overturn its north-south rotation traditions and pick the incumbent as its presidential candidate for 2011. The PDP also traditionally supports its incumbent for a second term at the presidency. For the PDP, an alternative would be supporting Vice President Sambo as its presidential candidate in 2011. For that to happen, however, Mr Sambo will have to demonstrate good political craftsmanship as the new VP still is seen as a political light-weighter. Also President Jonathan will have to show good leader abilities in the coming year, as the sudden power change has made most Nigerian voters focusing on the 2011 elections rather than on Mr Jonathan's new presidency. Mr Jonathan has not made any statements saying he will run in 2011, but several of his aides have indicated he will.